The Costa Forest Reef 200 eyeglasses feature a durable, lightweight, and borderless rectangular lens shape. Inspired by ancient underwater forests in the Gulf of Mexico, these eyeglasses were constructed with metal and acetate material to provide a comfortable fit. 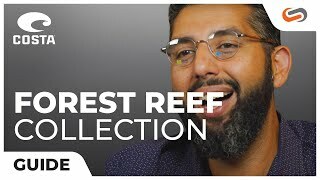 With many different colorways available, you will be able to create the perfect pair of prescription Forest Reef 200 eyeglasses from SportRx today.